La La Language: Sensory Saturday: Sailing! LM, Bear and I set sail on a beautiful breezy morning aboard the beautiful sailboat Tanzanite. Captain Joe and his crew were there to welcome us and give the boys a crash course in sailing. 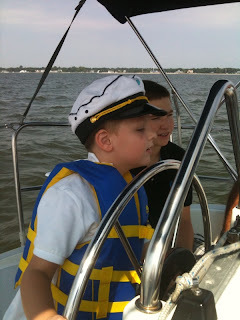 They were both little captains, taking turns wearing the captains hat and steering the giant wheel. LM was especially interested in the compass and learning how to navigate. 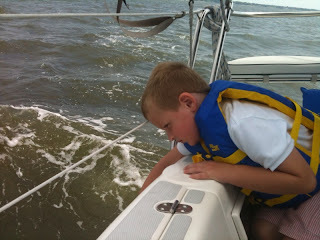 When it came time to hoist the sail, both boys helped pull the line (this puts the "heavy" into heavy work for sure!) -- with a look of pride they watched (and heard) the beautiful sail open and fill with air. We explored all the parts of the boat, the cool cabin, the helm and the bow. The wind was blowing, the waves were crashing ... the trip was perfect. Towards the end of our 2 hour trip LM leaned over the side and watched the water as we sailed through. Completely relaxed, lying on his belly,the boat rocking, trailing an extended hand through the waves - this was the picture of sensory peace. I expected to have a fun afternoon, but never thought it would be as therapeutic as it was. Linda was kind enough to send me a list of the therapeutic benefits of sailing. As you'll read - it covers ALL of the sensory bases! I can attest to each and every one. What a wonderful sensory experience this was! How awesome!! It was before we knew M had SPD but I remember how tranquil she was when we went on a glass bottom boat in Mexico. She loved the waves and the rocking. She wasn't scared at all. Thanks for the comment Jen - I have to admit, I was a little nervous thinking what if it's sensory overload and/or he gets scared? It was totally the oppisite though!